Designer tutus and tutu dresses for fashionable dogs and puppies perfect for Holidays or any day. A sparkly tutu dog dress for your seriously spoiled Greyhound. 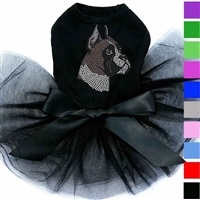 A sparkly tutu dog dress for your seriously spoiled Boxer. Sizes to fit large dogs. 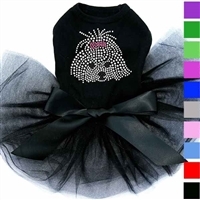 A sparkly tutu dog dress for your seriously spoiled Maltese. A sparkly tutu dog dress for your seriously spoiled Afghan Hound. A designer dog tutu dress with "Hugs & Kisses" in rhinestones. Sizes to fit small to large dogs. An Easter tutu dress for dogs with rhinestones. Sizes to fit small to large dogs. A Fall Leaves rhinestone tutu dress for small to large dogs. A fun and sparkly dog tutu dress for the big sister. Sizes to fit most dogs. A fun and sparkly dog tutu dress for the little sister. Sizes to fit most dogs.